My trip to Abeokuta on the 27th of February was nostalgic. It was nostalgic for many reasons. Some 25 years or so, on 20th November 1990, I had driven to the Olumo Rock City to begin my assignment as the first Commandant of the newly created Nigerian Navy Secondary School Abeokuta. The site wasn’t new to me. In the company of one of the founding fathers of the school, Commodore SO Lawuyi who was then the Chief of Naval Education, I had visited that same site in April of the same year for an on the spot inspection of the site to determine its suitability for a navy secondary school. I was just a lieutenant commander but the staff officer 1 at Naval Headquarters. That visit paved the way for the appointment letter, which I proudly carried to be shown to His Excellency the Governor of Ogun State Captain Oladeinde Joseph on assumption of office on the 20th November 1990. On the way to the Inter house sports competition that Saturday 27th February 2016 while at the back of my car going through the events of the last 25 years, I had my mind filled with stories. Some of my nostalgic feelings were rightly captured by Babajide Alao, a navy boy, in his book the ‘Memoirs of a Navy Boy’. In my foreword to that book, and in my 25 year anniversary lecture on 27th February, I had emphasised how we should all be happy that the dreams of the founding fathers are being met. The then Chief of the Naval Staff, Admiral Murtala Nyako, looking at the crystal ball, had mandated the staff of the school to run the place as the navy’s equivalent of the military school in terms of discipline and in excelling. We coined our motto ‘Excel Together’ from that mandate. The Silver lining, if I may use that word for the Silver Jubileee, is a thing of joy. Boys are now Men and they are all excelling together. The nostalgia of having a feel of the Navy Boys Parade and Inter House Sports Competition is better imagined than described. What with 2 navy boys of high repute and in the military at attendance and the past commandants on parade. Admiral Olumide, the Chairman was still as fit as the Eagle – so he was every time he visited the school while I was in command 25 years ago and always helping. Then the past commandants. It was difficult to remember in which capacity each came. This is because most rose to the peak of career by being the Chief of Naval Education. The reunion was indeed epoch making and I thank Lieutenant Commander Felicia Arukwe for organising it. I am writing this Blog today by to celebrate all the founding fathers, staff and students of the Nigerian Navy Secondary School Abeokuta and our parents who have collectively made the Navy Boys project a successful one. It is an ongoing project and it can only get better. The baton has been passed to Commander Abdullah and he needs our support. As the school is being celebrated let us bring to bear the attitude of excelling together so that the enigmatic navy boys would wax stronger. Every cloud has a silver lining. For the navy boys who have passed through this school the journey had been rough and tough. As we celebrate the Silver Jubilee, beyond the cloud we have started seeing the silver linings. 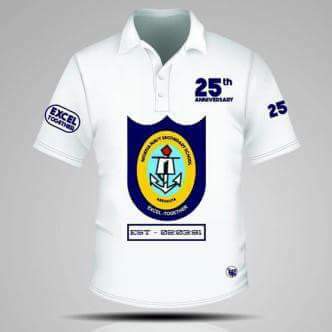 Happy Silver Jubilee today all Navy boys past and present. Keep excelling.